Automatic email notifications enhance communication and help streamline the work flow process. 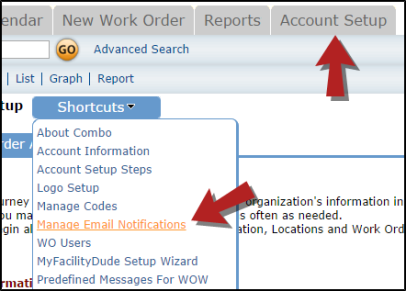 Each user role in Work Order has a list of automatic email notifications that are available for activation. When an email notification is turned on, it will apply globally to all users in that role. *Note: If a user does not want to receive the automatic email notifications selected for their role, they can turn off the feature under their personal participant information. Notify of NEW Work Request *Note: This will send an email for every new request at their assigned location. Notify Manager of Work Request Routed for approval or review *Note: Use only if your Managers are in the approval process. Notify Supervisor I of Work Request Routed for approval or review *Note: Use only if your Supervisor I's are in the approval process. Notification of Direct Reports Work Request Assignments *Note: Use if you have set up employees that directly report to your Supervisor I's. Notify Supervisor II of Work Request Routed for approval or review *Note: Use only if your Supervisor II's are in the approval process. Notification of Direct Reports Work Request Assignments *Note: Use if you have set up employees that directly report to your Supervisor II's. Notify of NEW Work Request*Note: This will send an email for every new request entered into the system. *Note: Select email notifications for the Comptroller when that user wants to receive emails that other users with the same role (usually Administrators) do not want to get.